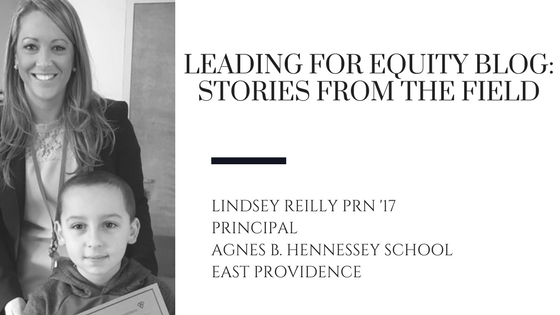 Question 1:How did the Principal Residency Network (PRN) change you as a leader for equity? The PRN enabled me to further identify myself as a reflective practitioner. The individualization of the program allowed me to build on the leadership practices I already had entering the program, and strengthen the ones that I had less experience in prior to the PRN. Learning in a community of other Aspiring Principals and their Mentor Principals was invaluable. Most of all, I am forever grateful for the quality mentorship of my residency mentor, Yanaiza Gallant, who was already successfully leading for equity and changing the course for students who were not being served in the system. Looking and developing a focus on all of CLEE’s core leadership practices (setting direction, building capacity, monitoring progress, reorganizing systems) allowed me to learn how best to use data and lead cycles of inquiry for improvement. We did this through the data dig and engaging in the action research process of leading a team of educators in my residency school to close an equity-based achievement gap. Question 2:How has your participation in the Novice Principal Induction Network (NPIN) program supported this year by the Rhode Island Foundation, and your teacher leader’s participation in CLEE’s Institute to Advance Equity assisted you in your principal role? How has it enable you to increase equity in your school? The support of the Novice Principal Induction Network (NPIN) allows me to strategically dedicate time for my own professional growth and learning. The professional networking with graduates of the PRN who were trained in the equity-based practices and are leading either in their first or second year of the program is invaluable. We are able to learn from one another’s successes, challenges and problem solve next steps together. The on-site coaching with critical feedback to help me reflect and create next steps is also beneficial. It is so easy to get caught up in the urgent needs of our schools. Being a part of NPIN provided me with the necessary time to step back from the day to day to reflect and look at my leadership growth holistically. Question 3: What do you think you have done in your leadership that has had the most impact on your school and why? Question 4: What’s next for you and your school? Hennessey and I will be staying the course; sustaining the momentum of all of the hard work we did this year; revisiting our mission, vision, and goals; and collaboratively setting targets for the 2018-2019 school year. In addition to our Hennessey-Orlo partnership, we are very fortunate to work under the supportive leadership of Dr. Sandra Forand, Assistant Superintendent and Superintendent Kathryn Crowley. Together we look forward to advancing our school improvement efforts! We will also be continuing our work with CLEE!